Jay Levin writes on property insurance and time element coverage for IRMI.com and has contributed 30 articles since 2005. He is a trial lawyer for Offit Kurman’s Insurance Recovery Group and has extensive litigation experience in multi-million dollar property insurance coverage cases, including cause and origin, valuation, and business interruption issues. 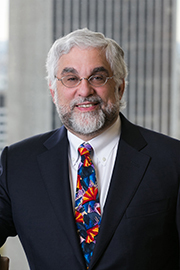 He has also litigated significant cases involving coverage for professional liability, general liability, medical malpractice, bad faith, and construction defects. He frequently speaks on insurance coverage and has participated in programs sponsored by the ABA, Computer Law Association, and Mealey’s. Links to his IRMI.com articles appear after his full biography, including his most recent March 2017 commentary. Jay focuses his practice on representing policyholders in disputes with insurance companies involving all types of insurance coverage. Jay has extensive litigation experience in multi-million dollar property insurance coverage cases, including suits involving policy construction and application, cause and origin, valuation, and business interruption issues. He has assisted clients in successfully resolving eight and nine figure Hurricane Katrina and Superstorm Sandy cases without litigation, and successfully representing other policyholders in litigating Katrina and Sandy cases. Jay represents financial institutions and other commercial policyholders in claims arising under fidelity and crime policies, including claims arising out of defaulted mortgages and employee embezzlement. He has also litigated significant professional liability and general liability coverage cases. In the Directors and Officers liability area, Jay actively works with clients to resolve all types of disputes, including application of exclusions and allocation issues. Jay has also arbitrated cases before the American Arbitration Association and in private binding arbitration. Most of his litigated cases involve allegations of bad faith and he is well-versed in that area, as well.